HCL announced the launch of HCL Maestros in Studio. HCL's endeavor is to create a platform for exceptionally talented and upcoming artists to showcase their talent, and giving audiences a musical experience that is grammatically undiluted, easy to comprehend, and accessible from the very confines of their comfort zones, be it home, office or during travel. HCL conceptualized Maestros in Studio with the mission of unearthing talent, and empowering young and accomplished classical music artists reach audiences that they're otherwise unlikely to be able to tap into with their own resources. The project started with identification of artists from the farthest corners of the country, and providing them with a carefully-constructed platform that would package their music with audio-visual finesse in order to attract younger audience to the genre. Over 300 musicians were identified, out of whom 100 were screened in great detail and finally 37 artists were selected to become the torchbearers of the future of Indian classical music. HCL has always been a patron of India's rich art and cultural heritage. To this end, HCL has been supporting Indian classical performing arts for over 20 years, organizing regular concerts across the country. These concerts have featured more than 500 artists, while reaching millions of music lovers. However, their goal is to cater to a new generation of Indian classical music listeners who appreciate good music. 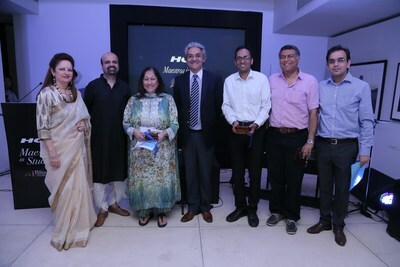 Since the digital platforms are the medium of choice for the young generation, HCL will release its first season of Maestros in Studio digitally, amplifying the reach of Indian classical arts. The project has yielded a huge repository of over 1,000 minutes of extremely high-quality audio and video content. Five cameras were used to accurately record a wide range of the artists' expressions and emotions and the audio was recorded in perfect sound settings. HCL believes that this will go a long way towards creating new benchmarks for the presentation of classical music in India.